Stars in the upcoming “Transformers” spinoff “Bumblebee,” Hailee Steinfeld and John Cena appeared on V Live on Thursday, talking about the film slated to open in Korea on Christmas Day. For the broadcast that aired from Hong Kong, Korean singer Eric Nam took up the role of interviewer. The film’s director Travis Knight and cast members were in Asia as part of a promotional tour. "We were able to talk to a lot of Korean people today who told us they really loved the movie. It’s very exciting just to know that we’re reaching people all over the world with a story that we’re proud of,” said Steinfeld. A spinoff of director Michael Bay’s “Transformers” franchise, “Bumblebee” stars Steinfeld as headstrong, vulnerable teenager Charlie Wilson who befriends the affable Autobot Bumblebee, with pro wrestling superstar Cena as Jack Burns, an agent of Sector 7. During the interview, Steinfeld and Cena tried on a cute bunny hat with controllable ears, which has become all the rage in Korea this season. “I feel like I need one of these when I don’t feel like talking to anybody,” said Steinfeld, moving the ears by squeezing the paws dangling from the hat. The ears had signs for “yes” and “no” attached to them. Both Steinfeld and Cena said they had never been to Korea before, but would love to visit sometime soon. Watch the broadcast at https://www.vlive.tv/video/103534. 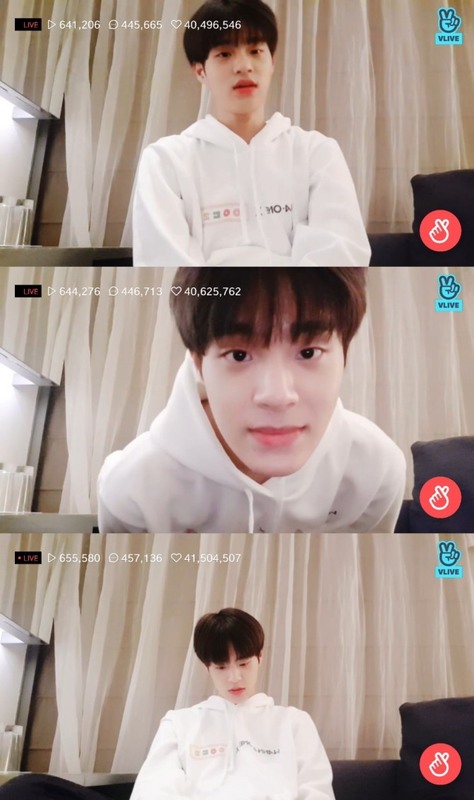 Wanna One bandmate Daehwi took to the V app Thursday night from a hotel room in Hong Kong to bring fans some much-needed updates. “Other members are resting in their rooms,” he said. The 11-member act was in the city to attend the third and final leg of the 2018 Mnet Asian Music Awards ceremony set for Friday. Daehwi answered fans’ questions on various topics including his body weight --around 54-55 kilograms -- and favorite carol. Fans asked him to sing and he mostly obliged. He also played a recording of the very first song he wrote as a K-pop trainee, which he said is “unbearable to listen to” now. His one-hour solo broadcast was watched by 676,515 people in real time and had recorded 43 million hearts when it ended. Watch his broadcast at https://www.vlive.tv/video/104023. 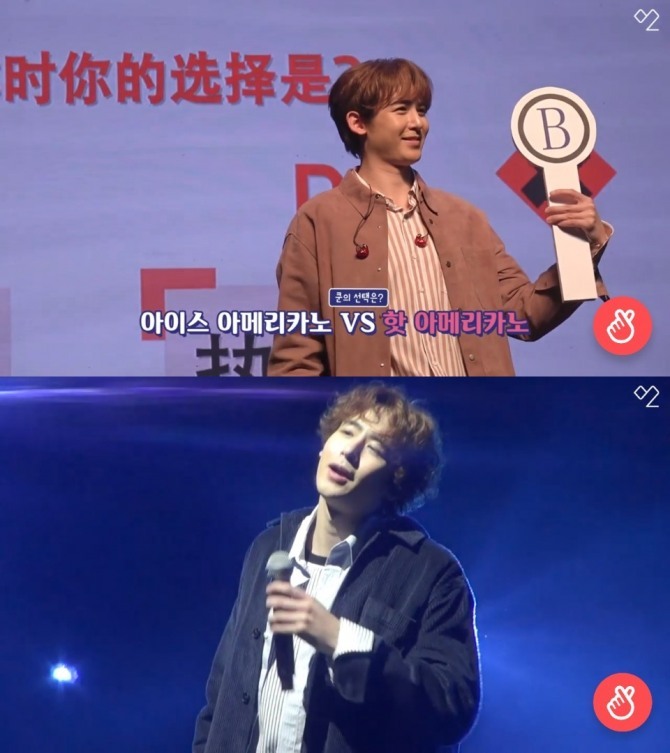 JYP Entertainment released scenes from Nichkhun of 2PM’s recent solo fan meetings in China, via V Live on Thursday. The six-minute clip features the singer’s first fan event in China held in Beijing on Aug. 18, and the second in Nanjing on Nov. 17. The singer played games with fans and shared his thoughts on various topics, in addition to performing. “I thought that without Hottest, we are really nothing and that we should really do more for a better us,” Nichkhun said in one interview, referring to the band’s fan club. “I will make more reasons for you to stay with us. I will become a better person and better musician,” he said.